Picture this: you finish a workout and the endorphins are kicking in, helping you feel great and energized. But the next day, your body is tired and you’re having trouble even lifting your arms over your head. You had planned to work out that day, but now you find yourself wondering, should I work out when I’m sore? The answer isn’t as straightforward as “yes” or “no”, but if you pay attention to the signs your body is sending you, you’ll be able to tell whether or not you should be hitting the gym. 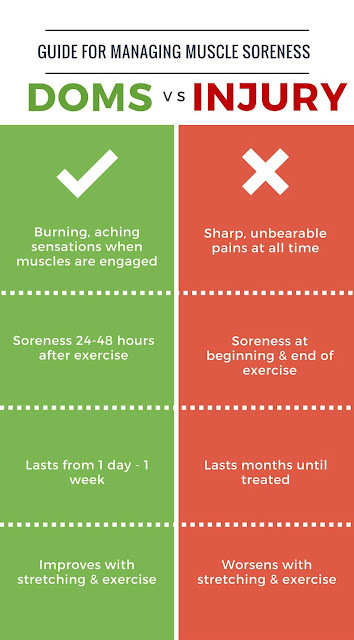 To help you and your body stay healthy and happy, we’ve put together some general guidelines on when it is and isn’t okay to work out when it comes to muscle soreness. To decide whether or not you should work out, you first need to focus in on the pain you’re experiencing. DOMS is short for delayed onset muscle soreness, and it’s the reaction your muscles have after an intense workout. These feelings of pain usually occur a day after you work out and can last anywhere between 24 hours to a week. These aches are a result of micro-tears in your muscles, and they can make daily activities like walking and lifting your arms suddenly become a struggle. DOMS can range in intensity from mild to severe—so severe that people sometimes struggle to walk or get out of their chairs. This is why it’s sometimes difficult to know whether you’re just sore or if you’ve actually injured yourself. Luckily, there are a few significant differences between DOMS and injury. The biggest difference is the pain level. You might convince yourself that you’re injured when getting up out of your chair is a struggle, but that’s nothing compared to the searing pain of a real injury. Your pain will come instantly and won’t decrease over time, no matter how much you stretch your limbs. Lastly, it won’t go away after a few days, but will last until you either seek medical attention or it heals on its own. If you think you’re experiencing symptoms of a real injury, contact your doctor so they can take a look. When it comes to your body, it’s always better to be safe than sorry. Once you’ve realized that what you’re feeling is just intense soreness, you’ll have to decide whether or not to work out. Some doctors recommend that if you feel any soreness, you should wait until it’s completely gone to start working out again. However, recent studies have found that it’s actually better to engage your muscles when they’re feeling sore. Exercising increases oxygen flow to the muscles, and in turn can help make your muscles feel better. You probably won’t max out in reps, but you can still get a decent workout in. To help make sure you don’t push yourself too hard, use a sleeve or other support that helps compress your muscles and prevent tearing, such as the new, innovative Body Glove Performance Knee Sleeves. Your joints will be protected and supported, allowing you to push through the soreness and rock your workout! The most important thing out of all of this is to listen to your body. If you feel too sore to work out, then take it easy for a couple of days. If you think you could benefit from light exercise, then go for it. If you start feeling fatigued, you can always stop and try again tomorrow!